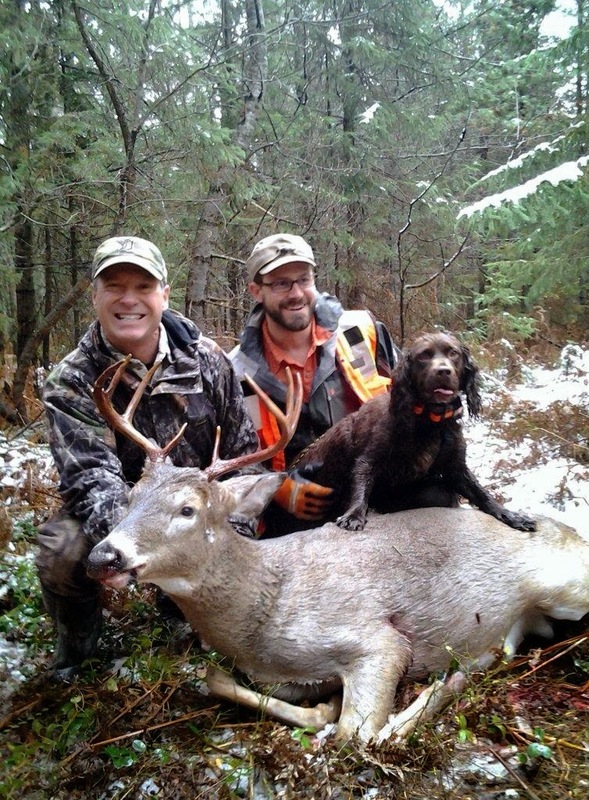 MICHIGAN DEER TRACK'N HOUNDS LLC Michigan's Professional Deer Blood Tracking Dog Services: Clear Lake Mi. Brad whiting. Clear Lake Mi. Brad whiting. this is email from a good friend, Brad Whiting. It took a lot of guts to write this and I commend Brad for sharing his experience….. I am about to embarrass myself with this story, but it needs to be told, and I would appreciate it if you posted this letter, as is, on your Facebook page, along with the pictures. Last Sunday morning I was still hunting in the swamps of St. Helen, MI in light rain, about 9:30am when I saw what appeared to be a 130-140 class B & C buck about 75yds in front of me. The buck was stepping through a small opening in the heavy cover in what would be my ONLY shot opportunity. I quickly shouldered the rifle, lined up on his front shoulder and fired. However, the buck spotted my movement and lunged simultaneously to the shot and I hit him mid-body. A gut-shot for sure. The buck lurched sideways, mule-kicked, and was gone. I was instantly sickened to my stomach as I knew I had just gut-shot what I thought would be one of the best bucks of my life. Making matters worse was that the rain was now gaining intensity. Finding no blood, hair, or anything where I assumed the buck stood at the shot, I did a few crossing patterns to try and cut blood. I did find a single spot with two drops about 80 yds from the shot. That was it. 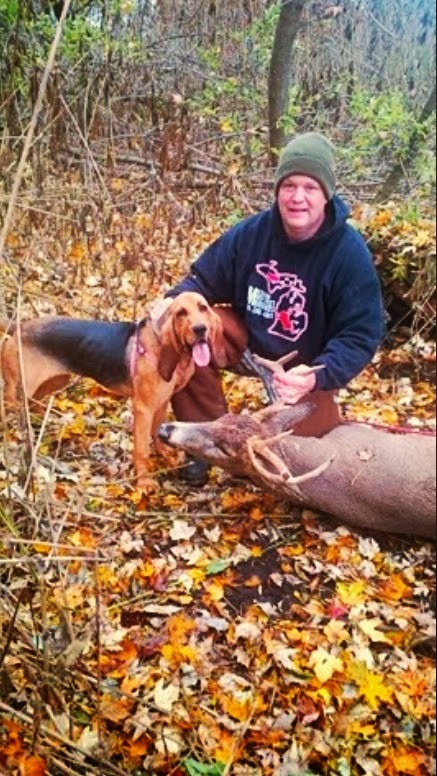 I decided drastic measures were in order and backed out, went to my cabin and retrieved the number for Rob Miller of Michigan Deer Tracking Hounds. I actually called three of the guys on the team and left messages. Rob returned my call within minutes. I explained the situation and he offered me a guy out of Petoskey that would be a little cheaper due to the travel time. Once I confirmed with Rob that the tracking hound Sypris was Rob’s dog, I decided to go with Rob as the little Dachshund Sypris is legendary. (She would later prove it.) From the time of the shot, until Rob’s arrival to the spot of the hunt, approximately 3 ½ hours had passed. The rain had been steady for the entire time, with several spells of heavy, driving rain to boot. As I waited for the tracking team to arrive, I was having serious doubts about the ability of any dog to track a deer in the kind of rain I was witnessing, and had witnessed since the shot. Thinking I had a real trophy on the ground somewhere, I decided to keep the scenario intact and rolling. I got Rob and Sypris to the spot of the shot, but had never been sure exactly where the buck stood, it was just too heavy of cover to know for sure without any sign of a hit. The only real evidence I had was two drops of blood about 80 yds away, marked with toilet paper, surely washed away by now. Rob called the DNR to get me permission to carry my rifle loaded, with no round chambered during the track job. He is registered with the state of MI, and as such, this would be allowed. Rob spotted a bit of fat in a shrub and we had a starting point. Rob inserted Sypris into the cover and within seconds, she took a direction and went with it. I became skeptical instantly as she was going away from my marked spot several yards away. Within 50 yds, Rob called me over to show me a huge clot of blood on the ground. Probing it with his fingers, he pulled out what we both agreed was a small bit of liver. I was elated. Going a bit further, I hollered up to Rob that Sypris would have to make a left turn very soon in order to somehow pass by my marked spot. Almost at the completion of my sentence, she did just that. Within seconds, we passed by my marked spot and Sypris was working steady and sure. We followed her, working a very vigorous and steady pace. I stayed off to the side, constantly looking ahead for the buck. We came to a small thicket that looked impenetrable. Rob suggested I get around toward the front in case the buck was lying in the thicket. 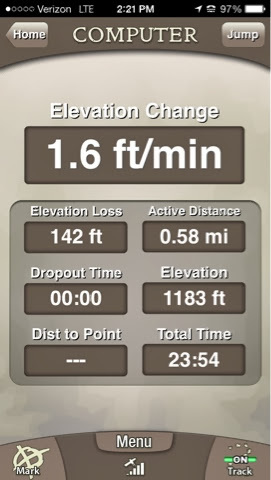 Within a second or two Rob hollered out he had more Blood, the first time in over a half mile there was any physical evidence Sypris was on track. I was again elated! Just then, I looked ahead and saw the buck bedded. I announced that I had spotted it and was going to shoot. I chambered a round, and as the buck began to rise, I fired, finishing it off in its bed at about 60 yds. I ran to the deer, adrenalin stoked, I was on cloud nine! But when I got to the buck, I couldn’t believe my eyes. The picture tells the tale. I will never understand how I made a 10-Inch, small hooped 3-point into a 140 Booner. Regardless of my wet glasses, heavy brush that I apparently attached to his head, it appears the real culprit may just be I have a child’s imagination (LOL). Either way, it was done, and I was embarrassed beyond words. Rob was gracious, offering encouraging words. Most important of which being my peace of mind. He explained had I not called him, I would have been tormented by the thought I’d left a buck of a lifetime to go wasted. He was right. As I pondered the entire chain of events that day, I realized how awesome it really was. 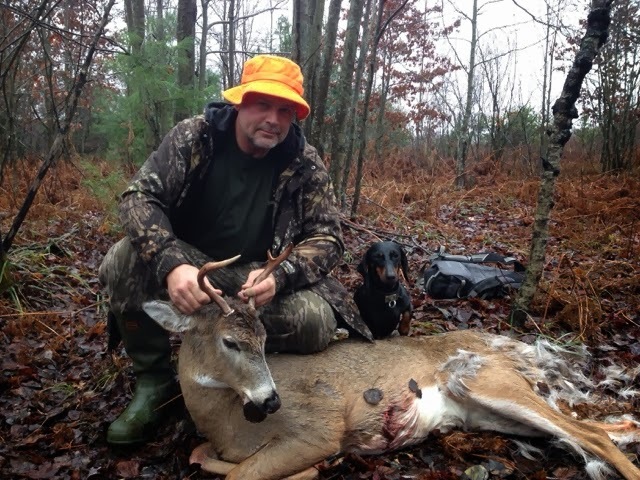 I could not be more impressed with the Master Deer Tracking Team of Rob Miller and his Dachshund Sypris. In my eyes, they had pulled off a literal miracle. Six-tenths of a mile, in 24 minutes, during a steady rain, and after almost four hours of steady and heavy rain, the buck was located and dispatched. I would never have recovered this deer otherwise. Rob took a call on a Sunday morning, left his family to drive from Linden to St. Helen, and found my deer. I will hope and pray this never happens again, but if it does, I know with 1000% confidence, my deer will be found. 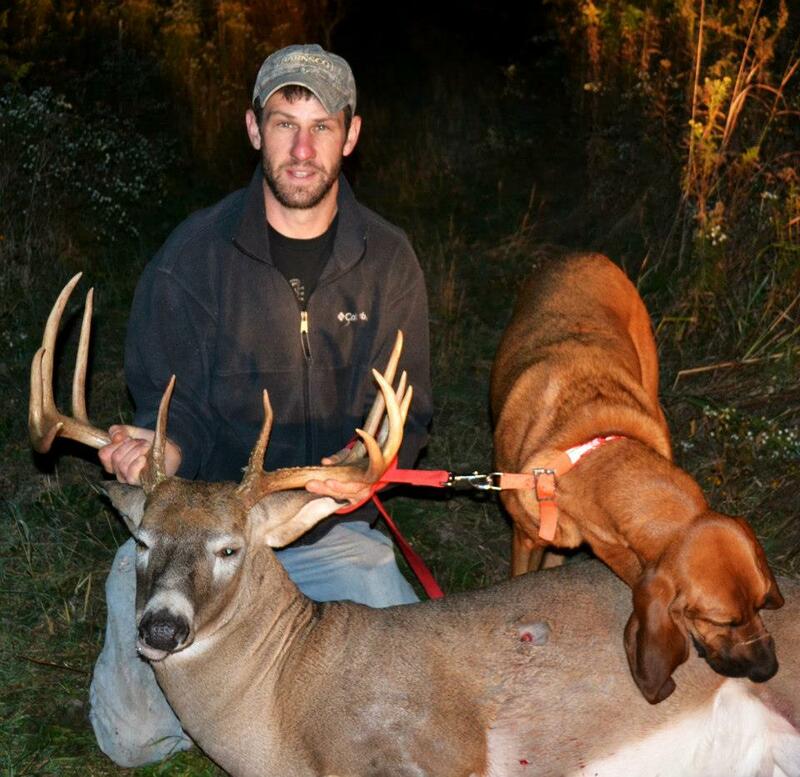 Everyone out there should know about these guys, and trust that the team from Michigan Deer Tracking Hounds are for real and really know their stuff. I am still in awe as I write this. Had you been there with me, you would be too. Although I'm using wet glasses, background brush, a snap deicision, and an overactive imagination as my excuses for that toy buck you and Sypris recovered for me, I wanted to come on here and thank you again in public for what was simply an amazing display of ability by Sypris. From the time I pulled the trigger on this deer, until the time you put Sypris on the track, about 4 hours had passed. In that entire time, the rain never stopped, and additionally, there were spells of hard, driving downpours to boot. I sat on pins and needles waiting for your arrival wondering in my mind how Sypris would ever be able to find that buck. And remember, at that point in time I thought I had a monster hit. As bad as it ended for me, finding I had indeed shot a 1 1/2 year old buck, and not the 130-140 class deer I had somehow dreamed I shot, witnessing you and Sypris find this deer was nothing short of Amazing! Six-tenths of a miles in 23 minutes, after four hours of steady rain, and the little hound never lost the track right from the start. I had trouble keeping up with you and her and was often trotting to pace you both. As I reflected on the events of the day later that evening I realized that although I dread the thought of a bad hit on any animal, at least I know if it happens again, and next time it is indeed a record sized deer, there is more than hope I will recover it, it is now an absolute in my mind. Conditions could never be worse than they were and you two made it look easy. Finally, I would like to thank you again for dropping what you were doing, and leaving your family on a Sunday morning at the drop of a hat and driving to St. Helen to do this for me. All in all, it was an experience I will never forget watching you and the little tracker pull off what essentially was a miracle in my eyes.